Saladin defeats Guy of Lusignan, King of Jerusalem in the Battle of Hattin. The battle in northern Palestine marked the defeat and annihilation of the Christian Crusader armies of Guy de Lusignan, king of Jerusalem, by the Muslim forces of Saladin. It paved the way for the Muslim reconquest of the city of Jerusalem and of the greater part of the three Crusader states—the county of Tripoli, the principality of Antioch, and the kingdom of Jerusalem—thus nullifying the achievements made in the Holy Land by the leaders of the first Crusades and alerting Europe to the need for a third Crusade. In July 1187 the Crusaders were camped at Sepphoris, about 20 miles west of the Sea of Galilee, when word reached them that Saladin had attacked the city of Tiberias along the lake. The Crusader forces included several hundred Templars and Hospitallers, militant monastic orders that Saladin ranked among the Christian armies’ most-effective fighters. On July 3 about 20,000 Crusaders abandoned their camp to go to the relief of the besieged city. Their route took them through a hot, arid plain where, halfway to Tiberias, they ran out of water while under continual harassment from Saladin’s cavalry. The Crusaders’ condition worsened after a night spent without water, but the next morning they resumed their march, heading toward a range of hills above the village of ?a???n. Confronted by Saladin’s army, the Crusaders, who were no longer able to fight effectively, left the road and were driven back against the two largest hills, the Horns of ?a?? ?n, by the Muslims. Although mounted elements of the Crusader army made repeated charges against the Muslim lines, they were unable to effect any significant breakthrough. 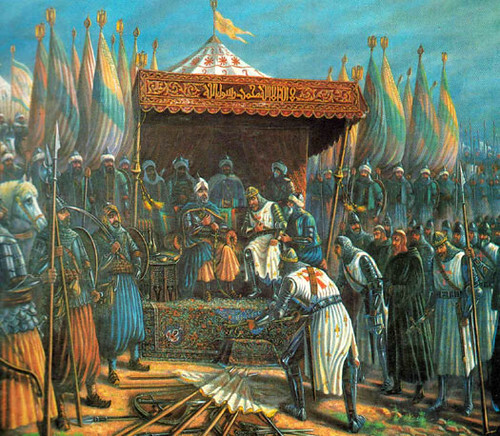 The 30,000-man Muslim army slaughtered many of the Crusaders on the field and captured a shard of the True Cross, a Christian relic that had been carried into the battle by the bishop of Acre. Saladin spared the lives of King Guy and most of the Christian lords, but he personally slew Reginald of Châtillon as an oath breaker for his role in shattering the truce that had been in place between Saladin and the Crusader states. Saladin also ordered the execution of virtually all captured Templars and Hospitallers; only Templar Grand Master Gerard de Ridefort avoided the blade. On the day after the battle, Saladin launched his campaign to retake the city of Jerusalem. "Men do less than they ought, unless they do all they can." This entry was posted in Uncategorized and tagged 1187, 4 July, Battle of Hattin by admin. Bookmark the permalink.